Believe it or not, many of my weekday dinners happen in sheet pans. Like, I dump everything onto a sheet pan, season it, and then roast it. It’s easy cleanup (huge bonus for me – I’m cleaning-averse), minimal prep, and roasting is an easy way to powerfully bring out the flavors in ingredients. Today’s recipe is an “almost” sheet pan supper, although it could be modified to be fully sheet-pan friendly. Let me explain. The only part of this dish that doesn’t happen in a sheet pan is the broccolini. 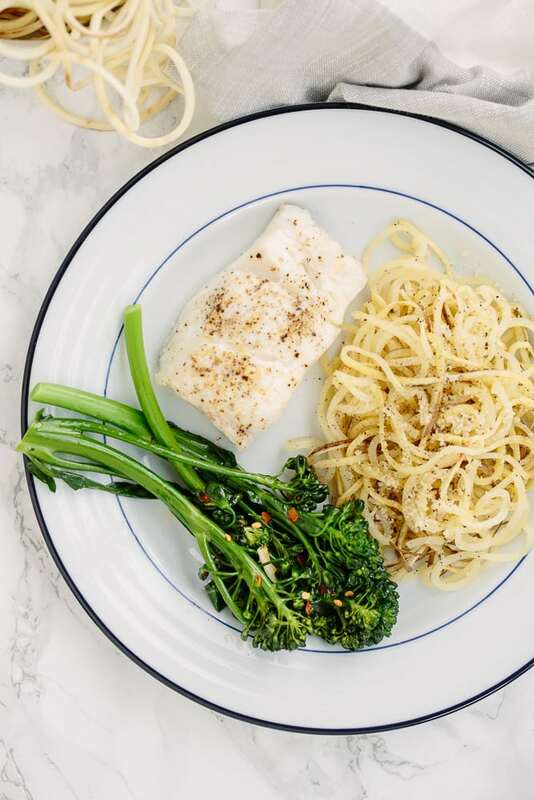 I’m a bigger fan of broccolini cooked in olive oil and garlic than I am of it roasted (I think the consistency is better when it’s sauteed in a pan), so I chose to prepare it that way. However, if you want to make this dish even simpler, pop that broccolini right onto the sheet pan and roast it alongside everything else! Just make sure to season with garlic powder to give it that deep, garlicky flavor. 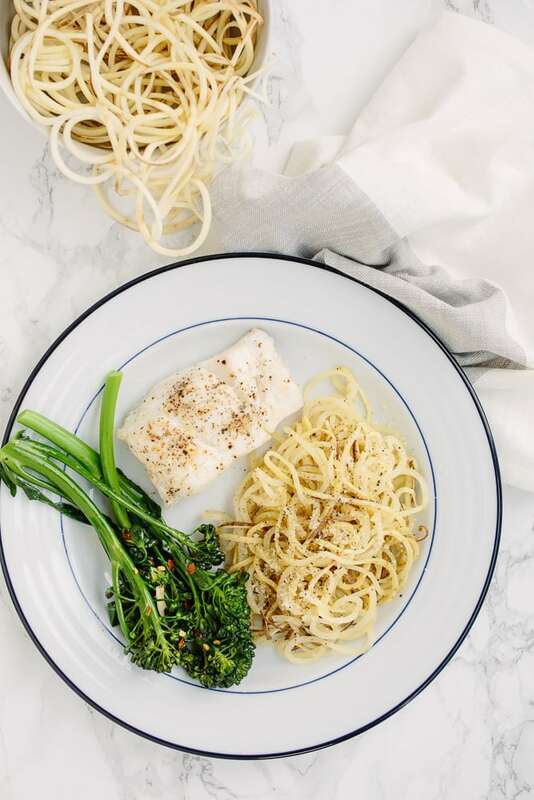 Cod is the perfect fish for this dish – it’s flaky and light and not too fishy, so the flavors of the broccolini and sweet potatoes can speak loudly. Speaking of sweet potatoes, yes, these white noodles are sweet potatoes! White sweet potatoes are a potato variety that I don’t cook much on this blog, because I way prefer the orange-fleshed sweet potatoes, but white potatoes are a little drier, so they roast well and soak up the olive oil they’re drizzled in. Of course, you can swap in orange-fleshed sweet potatoes here, if you’re confused/don’t want to go searching for this type of potato. I also sprinkled the sweet potatoes with a little parmesan to add some salty flavor, but if you’re dairy-free, leave it out – it’s not necessary! This week is all about clean-eating for me – I’m off to the beach with Lu on Thursday! We’re off to the Exumas in the Bahamas (where pigs swim in the water!) Has anyone been? Any suggestions/places to see? I’ll be sure to recap the trip in a vlog and blog post on inspiralizedali. 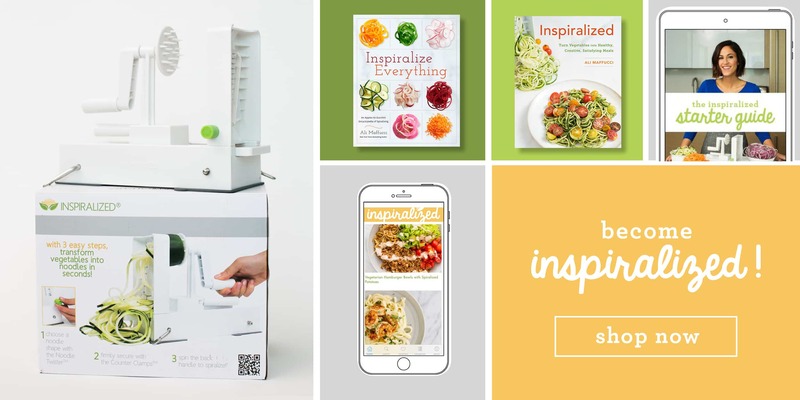 Now, go make today’s easy dinner – it comes together in less than 30 minutes and is low-calorie and full of nourishing, nutrient-rich ingredients! Preheat the oven to 425 degrees. Bring a medium pot filled halfway with water to a boil. Meanwhile, line a baking sheet with parchment paper and lay down the cod. Rub about 1/2 teaspoon per cod filet and season with salt and pepper. Line another baking sheet with parchment paper and layout the potato noodles. Season with olive oil, salt, pepper, and garlic powder and toss with hands to combine. 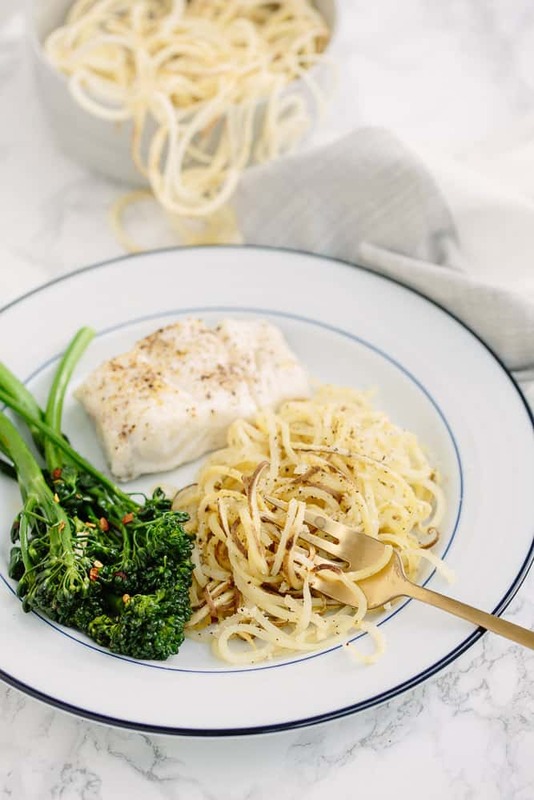 Add the potato noodles into the oven and then squeeze the lemon wedges over the cod and roast in the oven for 15 minutes or until the fish flakes easily with a fork. Watch the potato noodles – they should take about 15 minutes as well, but watch carefully so they don’t burn. Meanwhile, prepare the broccolini: Add the broccolini to the boiling water and cook for 3 minutes or until fork-tender. Drain into a colander and pat dry. Heat the teaspoon of oil in a large skillet over medium-high heat. Once oil is shimmering, add the broccolini and cook for 5 minutes or until it begins to brown. Add in the garlic and red pepper flakes and cook for 2-3 minutes more or until broccolini is charred. Can you use regular white potatoes with this recipe as well? I made this for dinner tonight and my family loved it. I was lucky enough to have a patch of kale sending up flower stalks (buds unopened) which I cut and used in place of broccolini. And I had a fun idea for the white sweet potatoes! Instead of garlic and olive oil, I stirred chai spices (cinnamon, nutmeg, cloves, cardamom, ginger) into a few tablespoons of melted butter and drizzled it over the spiralized sweet potatoes, tossing well to coat, before roasting. The oven's heat really brought out the flavor of the spices in a magificent way and the little crispy bits of sweet potato provided great textural contrast. Keeper. Michele, thank you for the glowing review! I'm so happy you enjoyed it. Hope to hear from you again soon! 5 star recipe, for sure. Thank you. I love that you give whole meal ideas, not just single dishes. i love sheet pan dinner ideas like this!! and i recently had white sweet potatoes for the first time and we just love 'em! also, these photos are gorgeous!! I made the sweet potatoes for breakfast. Being a busy mom, I forgot to set the timer. They came out deliciously crispy, more like hash browns. Perfect for breakfast! Thanks for all the wonderful recipes!